1941. 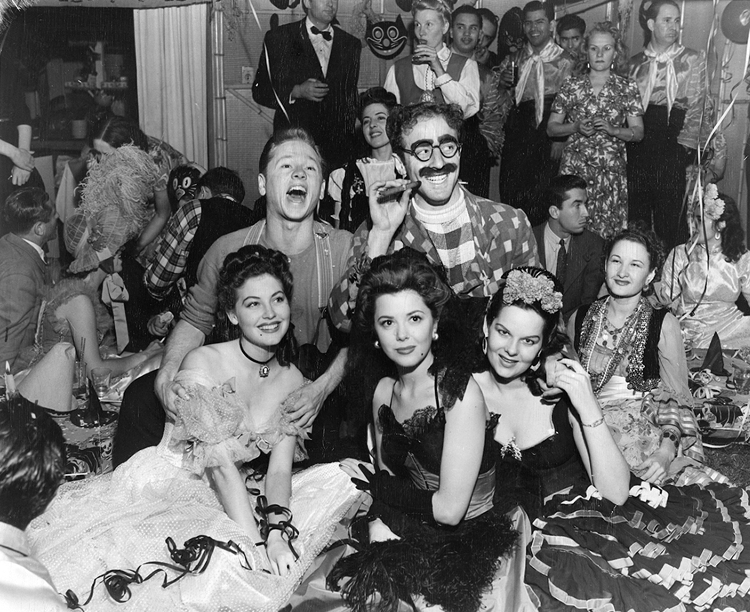 Ava Gardner and friends at an MGM Halloween party. This is Ava’s (front left) first year in Hollywood and it will be another six until she makes her breakthrough as Kitty Collins in The Killers. I still didn’t know that he was the biggest wolf on the lot. He was catnip to the ladies — he knew it, too. “The smallest husband I ever had, and the biggest mistake”. …more than just another set of curves. She had…a good memory, a considerable flair for hole-in-the-corner diplomacy to allay the suspicions of trigger-happy killers and a dual personality, closelipped about essentials and able to chatter freely and apparently foolishly about inconsequential. Virginia has had a string of affairs and she’s currently the mistress of the notorious mobster, Benjamin “Bugsy” Siegel. In 1947, she will take an unscheduled flight to Paris – five days before Bugsy is assassinated at her home. The first shot will hit him in the head, blowing his eye 15 feet from his body. Four more bullets, fired from a .30-06, will crash into his body, breaking his ribs and tearing up his lungs. It’s like something out of The Godfather. Anyway, the story is dramatised in the movie, Bugsy. Holding the cigar and pretending to be Groucho Marx is Alan Gordon, a press agent for, among others, Lana Turner, Linda Darnell and… Virginia Hill. He’s busy putting it about that she’s a southern heiress who throws star-studded parties – one of them at a bordello on Washington Boulevard – and who once gave her mink coat to a check girl at the Mocambo as a tip. In truth, most of the stories emanating from his office are phoney. Witty sayings are attributed to his client Arthur Murray, who never says a funny thing in his life. Twosomes made up of people who aren’t even acquainted are reported at client restaurants and nightclubs. Completely fictitious dramatic stories about clients make the lead in the gossip columns. He’s brilliant at his job and very successful, and will go on to set up Alan Gordon Enterprises, a motion picture equipment specialist that continues to this day. It’s costume party time in Talkie Town with all the actors and actresses playing make-believe after the studios close. Mickey Rooney and his pal, Alan (Groucho Marx) Gordon are the guys. The gals are Ava Gardner, Mickey’s current sweetie, Ann Rutherford, and Virginia Hill.